With the recent update of the e-commerce software Cloth ‘n’ Craft is using, this page is not a work in progress. 2. Add your Product name and description of product. 3. 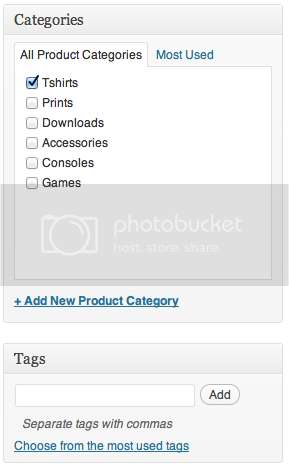 Assign your product to appropriate categories in the right hand column. 4. Click on ‘Set featured image’ in the right hand column. Upload your main product image (or choose one you have already uploaded in your media library), add your image title, click on ‘Set Featured Image’. Note – keep images to a maximum resolution of 500×500 pixels. This conserves your upload space. 5. You can add more products images to the “Product Gallery” (right hand column below the featured image) in the same way as adding your Featured Image. 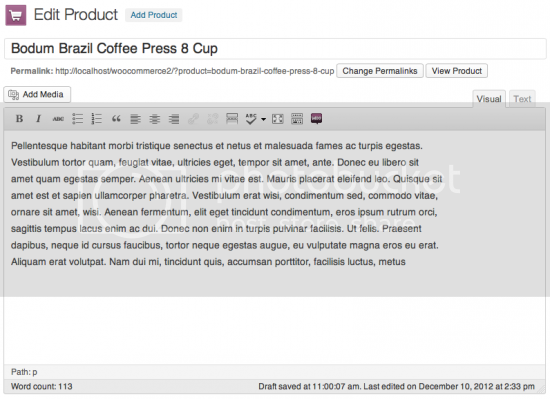 Images in the product gallery can be re-ordered easily via drag and drop. Simply re-order your images by moving them around. 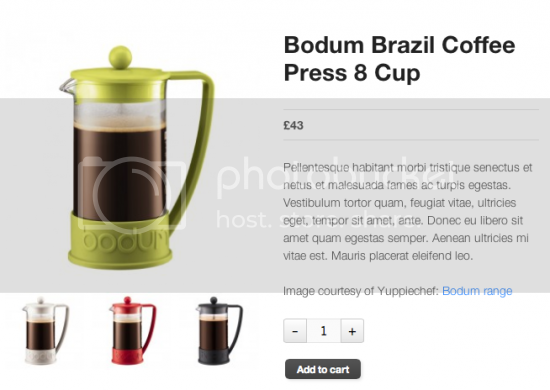 To remove an image from the product gallery, hover over the image and click on the red “x”. The images will appear on your product page like below. a) The Simple product type covers the vast majority of any products you may sell. Simple products are shipped and have no options. For example, a can of drink. b) A Grouped product is a collection of related products which can be purchased individually. For example, a PS3 could be a grouped product as there are 80GB, 120GB and 200GB variations of that same parent product. c) An External or Affiliate product is one which you list and describe on your web site, but is sold elsewhere. d) A Variable product is a product which has several different variations, each of which may have a different SKU, price, stock options etc. For example a tshirt available in several different colours and/or sizes. Most products you enter will be either Simple or Variable. You can choose Simple to start with and change it to Variable at a later date. Complete your Product Data by adding your Stock Keeping Unit number (SKU), Price, Sale Price (Optional), Tax Status & Class (if relevant). Click on Inventory and select “Manage stock?” if you want it to track your stock levels, enter the number in stock and choose whether you want to limit sales to items in stock only or allow backorders. 6. Add your variations (if applicable) by clicking on Add Variation, adding your Variation names, Stock Keeping unit number, price and quantity. 7. Complete the extra Shipping costs if the product needs extra allowance made for shipping. 8. Upload your file if your product includes a file that your customer downloads (if it is a downloadable product). 9. Now click on Publish and when you go to your site you’ll see your product displayed in your store page, on the products listing page and the individual product page.